U.S. Rep. Pete Sessions. Photo via Wikimedia. Two bizarre Tweets that stayed up for days was the result of a simple gaffe, his campaign spokeswoman says. 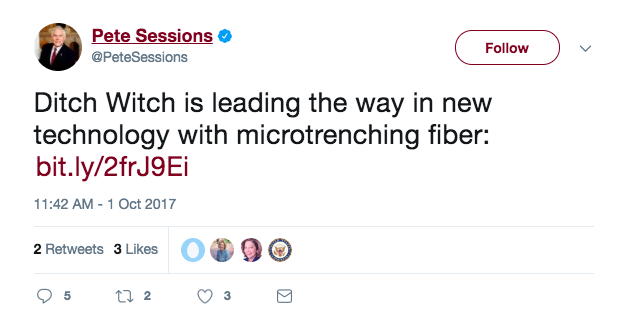 A few eagle-eyed FrontBurnervians brought our attention to the tweets, and about a dozen other commenters berated the congressman for promoting a company through his Twitter feed. So I called Caroline Boothe, Sessions’ communication director, and asked what it was all about. She says it was a simple twitter organizational gaffe that happened twice and went unnoticed. She did sound aghast that they’d gone out through the congressman’s account and emphasized that Sessions has no financial ties to Ditch Witch or its parent company, Charles Machine Works. I looked through campaign finance reports and found no tie there, either. Simple mistake. Her father is the president of Ditch Witch New Mexico, and she helped run the chapter’s Twitter feed in college. 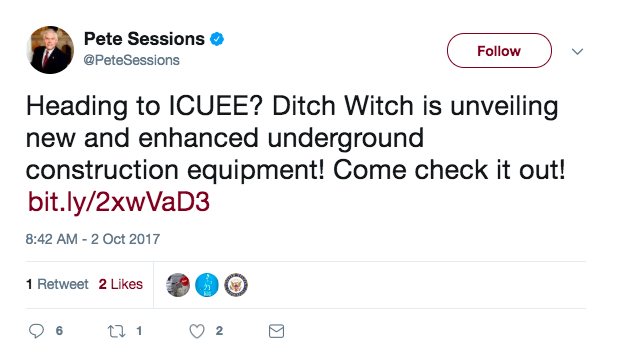 The company recently handed the social keys to a third-party called Commercial Web Services, and it appears Sessions’ account was somehow linked to Ditch Witch’s. The same language was used on the company’s other accounts. She says she’s not being paid by Ditch Witch, either, which is important considering this ethics rule.